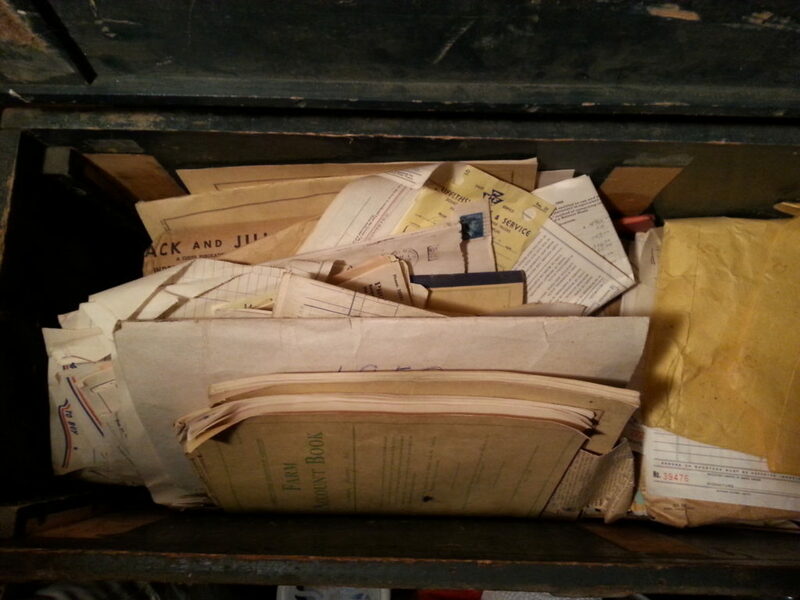 In honour of International Archives Day on June 9th, I am writing my first in a series of what will hopefully be helpful advice about your family archives. I am going to be throwing some archival terms around. Do not be afraid (of Virginia Woolf). She will be helping me. This is a cautionary tale to explain why you should not “tidy up” your eccentric Aunt Mabel’s box of documents and photos. The way that she kept her records (even if there seems to be no order) reveals information about Mable herself in all of her quirky, messy glory. I like the definition that King’s College Archives in the UK uses: Original order simply means keeping things in the order which the person or institution whose archive they were originally kept them. This is important because certain records may have been kept together for a reason, even if it is not immediately obvious to you what that reason was. In 2005, I attended a talk by Edmonton author Ted Bishop* where he spoke about his award-winning book Riding with Rilke: Reflections on Motorcycles and Books. At the talk he pointed out that he had wanted to use the word Archives instead of Books in the title, but his publisher figured that people would not want to read a book about archives. What!?! Inconceivable. If records have been messed with and are obviously not in the original order, archivists work to restore the original order, but this requires research and time and is not always possible. Archivists bring an “intellectual” order to records without physically reorganising them, so that a researcher will have an easier time of locating what they want in the records. Ted Bishop explains one of the differences between archives and libraries in these passages from his book. Though special-collections libraries were for me serene oases, they are in fact contested terrains, for they straddle the border between libraries and archives. Initially the Woolf books had been housed together, but archivists and librarians order things differently. When a new curator, a librarian, took over, he shelved the Woolf books separately, according to their subject call number, dispersing the collection. That was his job; yet for an archivist the job would have been to keep the documents together, to treat them as a text in themselves, even if possible to keep them in the same order that they had been shelved in Woolf’s house. In any case, what I wanted in Pullman no longer existed. They had four thousand books and it would have taken days to assemble them… I had not come to read individual texts…What I wanted was to gain some sense of what had been read… A personal library is not just a repository, it is a display, a performance…Virginia’s notebooks let the end of one novel run into the notes for the next and might include a book review starting from the back and written upside down on the blank leaves…so that at a certain point the two texts met, topsy-turvy and going in opposite directions. How would she have arranged the library? By dutifully following his training and the Dewey Decimal System, the librarian had destroyed a part of Virginia Woolf’s life story and the integrity of her personal library. The original order had been lost. Marlena Wyman is the City of Edmonton’s Historian Laureate, an archivist and a visual artist. She will be writing further missives regarding archives, including what types of records we should keep, how to preserve our records before they are donated, and how to donate our records to an archival institution.